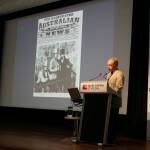 State Library Victoria – Don Grant Lecture 2011 videocast available! Don Grant Lecture 2011 videocast available! Want to relive or discover for the first time Dr Andrew Lemon’s outstanding Don Grant Lecture 2011 on the topic Storming the barricades – the family history revolution? The Lecture organised by the Victorian Association of Family History Organisations was given on 1 August this year as part of the State Library of Victoria’s annual Family History Feast. In the Lecture Dr Lemon describes his fascinating search for the real identity of Peter St Albans, who won the Melbourne Cup in 1876 riding Breisis, and is the youngest jockey ever to win the race. Andrew is president of the Royal Historical Society of Victoria. He edited the Victorian Historical Journal throughout the nineties and has written numerous books on history, including the History of Australian thoroughbred racing trilogy. The videocast of the presentation is now available in two parts on the Library’s website. Podcasts of a number of the other talks given at Family History Feast 2011 will follow shortly. Enjoy! 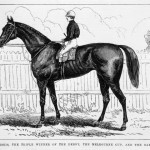 Briseis, the triple winner of The Derby, The Melbourne Cup and The Oaks, 25 November 1876 A/S25/11/76/136 Wood engraving published in The Australasian sketcher. An extant stained glass window made c. 1891 exists at ‘Suma Park’ near Queenscliff. Vic. See web site link.